The term ‘postmodernity’ has been used to describe that historical transformation of the late 20th century when the institutional breaks holding back individual emancipation disintegrated, thereby giving rise to the full expression of individual desires and the quest for self-fulfilment. 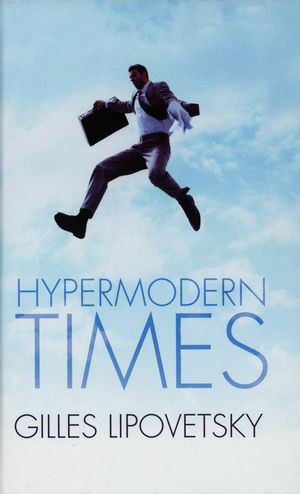 But there are now signs – argues Gilles Lipovetsky, one of the most original social thinkers in France today – that we’ve entered a new phase of ‘hypermodernity’, characterized by hyper-consumption and the hypermodern individual. Lipovetsky is an important thinker in France and his ideas and responses to current intellectual debates surrounding modernity and postmodernity discussed in this book will travel well. This book presents a highly original new way of thinking about modern society and the individual. The book is short and concise and provides a good introduction to Lipovetsky’s work as a whole. The book will provide an excellent overview of the theories of modernity, post modernity and hypermodernity for the upper level student.